You’ve watched them playing on the field, you’ve watched them steal your heart, now get to know them a little better. Musafir.com caught up with some of the Kerala Blasters players and had them spill some secrets, right from their football games to their favourite cuisine. 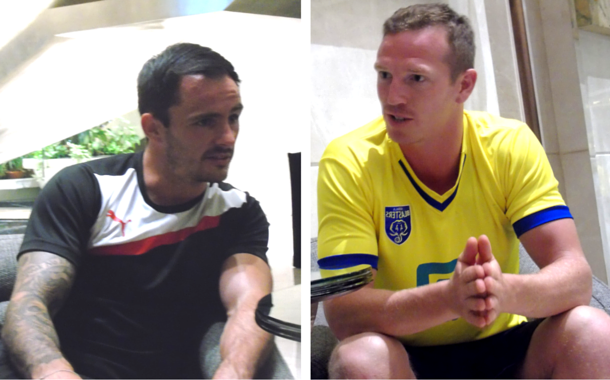 First off, we got a chance to talk to two English hunks, Chris Dagnall and team captain Peter Ramage. After the preliminary round of introductions we explained to them that they’d achieved a celebrity status in the short span of time. We settled in the comfortable chairs of the plush St Regis Hotel in Mumbai and got right into the thick of things. Q: So... Lets begin with something easy, where are you guys from? 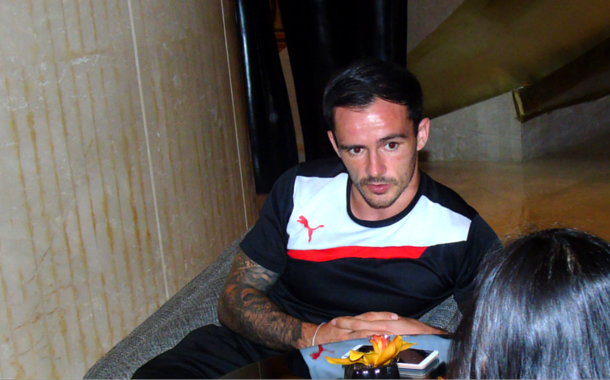 C (Chris Dagnall): So originally I’m from a city called Liverpool in England. P (Peter Ramage): I’m from a little town in the North of England called Berwick upon-tweed. It’s a beautiful little town. Q: How different is India from your home town? C: It’s completely different, India. You know I think all the English lads that we come here it’s a massive culture shock. The way of living is completely different from back home. It’s been an enjoyable experience. Ultimately something different. P: Yeah I agree. It’s chalk and cheese. I’ve friends who’ve visited India before on holiday and work and they tell you about the culture shock but nothing prepares you for it. But it’s a beautiful country. I’ve really enjoyed my time here, hope we have more time here. (Laughs). Q: So where all has your football career taken you? C: Well.... This is the first time outside of England I've played football. I’ve played all around England, London, Liverpool, Manchester. So yeah, this is the first time off site. P: Oh jeez, I’ve got a list as long as me arm, I've been from Australia to America and everywhere in between actually. Israel was probably the furthest I've been Europe wise. Q: You’ve been here in India for a while now, so which all cities have you visited so far? C: We’ve been around, I think most of the major cities by now. Obviously Mumbai, Kochi, Trivandrum and Goa which was a nice place to visit. P: Yeah, and we’ve still got Delhi left, so looking forward to that. Q: Great! So which city did you find the best? Where you had a really memorable experience. C: Well I’ve enjoyed Goa. We were there for a couple of days. So Yeah we had a good time. P: For me it’s Kochi. The sheer noise value is just amazing. I mean in England, football wise it’s steeped in tradition. I’ve played in you know, Manchester Utd and Liverpool, and them grounds are fabulous. But the energy in Kochi, it was just, yeah, it’s been incredible. Even Pune, our hotel was overlooking a favela (slums) kind of a system. I mean you think it’s just in movies but when you see it in reality it’s just fascinating. Q: Well you guys are quite famous and you’ll have a huge fan following. So have you had any crazy or unique fan experiences? C: (Smiles. )Yeah I’ve seen a few crazy fan experiences, especially some of them come onto the ground and just sprint right along and follow the coach. And after the match they’ll just chase the bus for about 20 minutes. So yeah that’s pretty crazy. P: (Laughs) Yeah, there’s been a few. That one guy he just runs alongside the bus and he’s painted yellow. Just that and shorts. Q: If not football, where would you be right now? P: Oh I don’t know. It’s always been football. How young were you when you decided that this is what you wanted to do? P: When I was about 4 years old. It’s just where I’m from. All I did was play football. My parents were strict of me to do my education and I was good at it. But I wanted to play football full time. Having chatted about football a bit we shift the focus of our conversation onto travel. Getting to know a little bit about their travel ideas and travel styles. Q: Where all have you travelled for leisure? When you’re not busy playing football where do you vacation? C: Me and family go on a holiday, we’ve been to Thailand, Dubai. My wife likes Dubai, it’s one of her favourite places. We went to Bali last summer. Most of Europe, been to a few countries there Spain, France. P: Yeah me and my wife love to go Dubai. We went there for our honeymoon. I have two young children and we went to Ibiza. P: I know everyone in Europe thinks it’s a party destination but we went to the other side of the island and it was absolutely stunning. We’re probably going to go there again with the family. Q: Do you have a travel bucket list? C: Umm... No, not really. We just decide, sit down and surf for hours where we want to go. Actually we want to go to America. P: Yeah, I have one. New York for Christmas and funnily enough one of my friends just got engaged so I’ll get a chance to go there. Even Canada. Love to go back to Australia, been there only for football. Q: What type of a traveller are you? C: Yeah I’m a bit of an adventurous one. We like to get up and see the place we’re visiting, you know some just like to sit on the beach. We like to see the city. So does this mean you’ve tried adventurous stuff like bungee jumping? P: I like a little bit of everything. I’m not a big backpacker. A lot of my friends went off to travel and do that kind of things, but that is not my scene. But I do like to take photos, I do like my photography. So does this mean you’re a photographer? P: Oh no. (Laughs). I just like to dabble in it a bit. In fact another one of our players CK Vineeth is a very good photographer. Yeah, he just goes off out and explores. I would have liked to do that. But I’m more of a sit on the lounge and relax kind. Q: Speaking of restaurants, what’s your favourite cuisine? Yeah? What’s your favourite dish? C: Uh. Sushi, yeah. The spicy tuna sushi, can’t get enough of ‘em. I got a little bit of it in this hotel as well, it was brilliant. P: I’m not much of a foodie but I like my food. I’ve tried a couple of things here as well. But it’s too spicy (Laughs). When we go to hotels, us European boys just stick to our pastas and chicken.